From the Missouri Botanic Gardens website: "Plants of Merit are plants selected for their outstanding quality and dependable performance for the lower Midwest. They grow consistently well in Missouri, central and southern Illinois, and the Kansas City Metro area." Minimum requirements to earn the Plants of Merit award are: "Easy to grow and maintain; Not known to be invasive in our area; Resistant or tolerant to diseases and insects; Has outstanding ornamental value; Reasonably available to purchase". To learn more about the MBG Plants of Merit visit the Missouri Botanic Gardens website. Not only does their website offer these award winning selections it also has an enormous and detailed plant database with excellent information for both gardeners and professionals alike! The 2011 Perennial Plant of the Year! 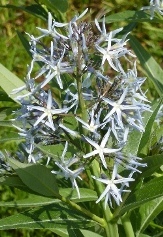 Arkansas Blue Star provides three seasons of interest with starry light-blue to nearly white flowers in spring, soft-textured narrow medium green foliage in summer, and wonderful golden yellow, orange, and chartreuse fall color. A sun loving and heat tolerant reliable perennial that is mannerly enough to grace any garden. Item# 9715. Remember how Elephant Ears were considered invasive, guess what this one is not! From the Royal Hawaiian series of Colocasias comes Black Coral, a tightly clump forming, cold hardy perennial with a great tropical effect in the garden or in containers. The large 3'+, almost heart-shaped, tropical foliage of Black Coral Elephant Ears is a glossy dark black that sits atop black stems and is sure to make a statement. Item# 10628. A beautiful and durable native perennial that produces 2-6" clusters of orange-yellow, orange, to orange-red flowers. This taprooted clump-forming, perennial may be found in flower from mid-spring to early fall. Butterflyweed is a durable, drought tolerant native that is considered by many to be an important Monarch and Queen butterfly host even though is does not have the milky sap of most milkweeds. Item# 9714. The rounded white to greenish-white, rounded, flower clusters sit atop thick sturdy stems that emerge from the rosette of soft yucca-like foliage. This is a tough native perennial whose long-lasting summer flowers will attract a myriad of butterflies and other pollinators to your garden. Item# 9260. Researchers have found that Native Americans created shoes from fibers of the tough, spiny-edged, yucca-like plant as early as 8,000 years ago. Evidence was found in a Missouri cave by archaeologists. From Nat'l Geographic, 1999 article. Lightly honey scented, white to cream, tight ball-like flower clusters are produced on new growth in late spring and summer and attract an array of butterflies, bees, and other garden beneficials. The Buttonbush is a vigorous, medium-sized to large growing, deciduous shrub that does best in consistently moist soils with most of a day of sunlight. A moderate to severe annual pruning of established plants in late winter helps to promote fuller plants and the most flowers. Item# 9247. 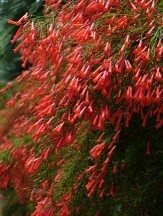 2-3' high spikes of glowing scarlet tubular flowers are produced in late spring or summer on this US native wildflower. 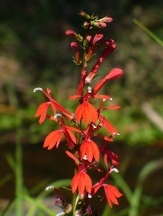 A rosette forming herbaceous perennial to biennial, the Red Cardinal Flower is commonly found along stream banks, marshes, and bogs and will perform well in average to wet garden soils. Attracts hummingbirds and other pollinators. Item # 1217. 3-4" wide, yellow, sunflower-like flowers are born on 4-8'H+ sturdy stems over an extended period in summer on this durable, native, clump-forming, tap-rooted perennial. 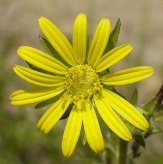 The dark green, deeply dissected foliage of the Compass Plant was used as a compass as the large leaves generally point north and south. Attracts butterflies and other pollinators. Item# 10309. 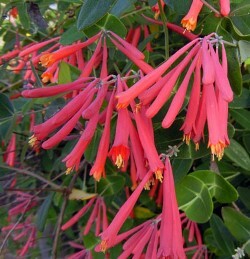 An exceptionally free flowering form of our native Coral Honeysuckle producing a nearly continuous display of red tubular blooms with a yellow throat. 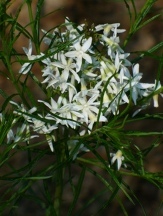 Dan's Everblooming begins flowering in late winter and early spring and lasts through fall on established plants. This variety and may produce a few flowers throughout winter even in zone 8B. Item# 9729. Hopefully this item will be back in stock mid-to-late 2018. Use our 'Notify' tool to get a notice!! Grows To: 6-10'(-15')H, spaced at 4-6' or more. 1" tubular orange blooms, tipped in white, are produced from spring to fall. An upright to arching shrubby perennial. Sun tolerant. Attracts Hummingbirds. 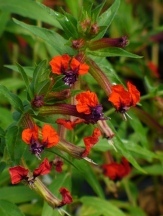 An excellent and easy hybrid Cuphea that flowers nearly non-stop from spring through fall. In the portion of its range where freezes occur it can be grown as an annual or if protected with a mulch it is generally reliably perennial well into zone 8. Item # 361. 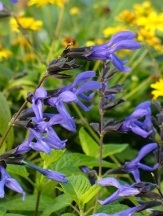 Intense blue blooms are held in clusters atop this durable low spreading perennial. A good choice as a groundcover for hot sunny, well-drained locations. Item# 1173. A beautiful and durable native perennial that produces 2-6" wide clusters of flowers that are excellent for pollinators. This is a brightly colored mix and the plants produce flowers that are either sunny yellow, birght orange, or deep red. This taprooted clump-forming perennial may be found in flower from mid-spring to early fall. Butterflyweed is a durable, drought tolerant native that is considered by many to be an important Monarch and Queen butterfly host even though is does not have the milky sap of most milkweeds. Item#10715. 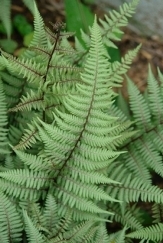 The soft silvery fronds of the Ghost Fern contrast nicely with its dark maroon nearly black midribs. It is perfect for moist shady gardens where its upright growing fronds are sure to be a stand out among surrounding perennials. A beautiful accent among darker foliaged perennials, or use it in mass, as a border, or even as a groundcover. Item# 10851. The most floriferous Esperanza that we grow! Gold Star Esperanza produces an endless display of large clusters of large golden yellow, lightly fragrant trumpets from late spring to frost. This Greg Grant selection is the standard by which all other Esperanza's are judged. Hardy, heat and sun loving, and with a nicely branched habit Gold Star Esperanza is great for tropical settings in containers and in the garden. Attracts pollinators including butterflies, hummingbirds, and bees. Item # 9902. Large drooping panicles of fragrant fleecy-white flowers adorn this small, native tree in spring and are followed by clusters of tiny black olive-like fruit in summer and fall and are great for birds. The Grancy Graybeard is a tough and adaptable small deciduous tree with a medium rate of growth that is makes an excellent understory tree, specimen, or in mixed natural landscapes. It is also tolerant of urban settings. Item# 10958. Texas big blooms are a hallmark of this rich orange flowered crossvine. This is an absolute show stopper when in full bloom! 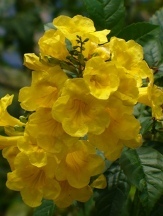 Produces a huge mass of 2-1/2" orange trumpets with yellow throats in late spring with some flowers throughout summer. A vigorous and disease free southern native. 'Helen Fredel' is another excellent introduction from noted Texas horticulturist and author Greg Grant. Attracts hummingbirds and other pollinators. Item# 9576. Grows To: 30-50'H, easily trained to a 6'H fence or other support. A beautiful and durable native perennial that produces 2-6" wide clusters of flowers ranging from sunny yellow to golden yellow that are excellent for pollinators. This taprooted clump-forming perennial may be found in flower from mid-spring to early fall. 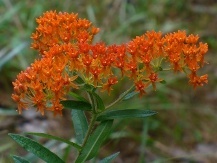 Butterflyweed is a durable, drought tolerant native that is considered by many to be an important Monarch and Queen butterfly host even though is does not have the milky sap of most milkweeds. Item# 10716. A must have Hydrangea! 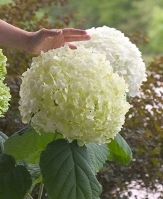 A new and improved 'Annabelle' with strong beefy stems and massive blooms from mid-summer to fall. 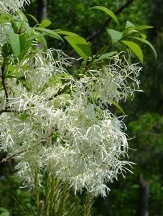 Blooms open an attractive lime-green, change to white, and age to green. Foliage is large, dark green, healthy and provides yellow fall color. Item# 1063. A must have Hydrangea! A new and improved 'Annabelle' with strong beefy stems and massive blooms from mid-summer to fall. 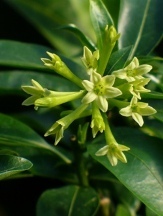 Blooms open an attractive lime-green, change to white, and age to green. Foliage is large, dark green, healthy and provides yellow fall color. Item# 10339.